When one packs for a trip, the carry on is essential. So make a check list. Phone? Check. Wallet? Check. Headphones? Check. But what else? We recommend you add some accessories. As the fall weather sets in, gold will add interest to any look. 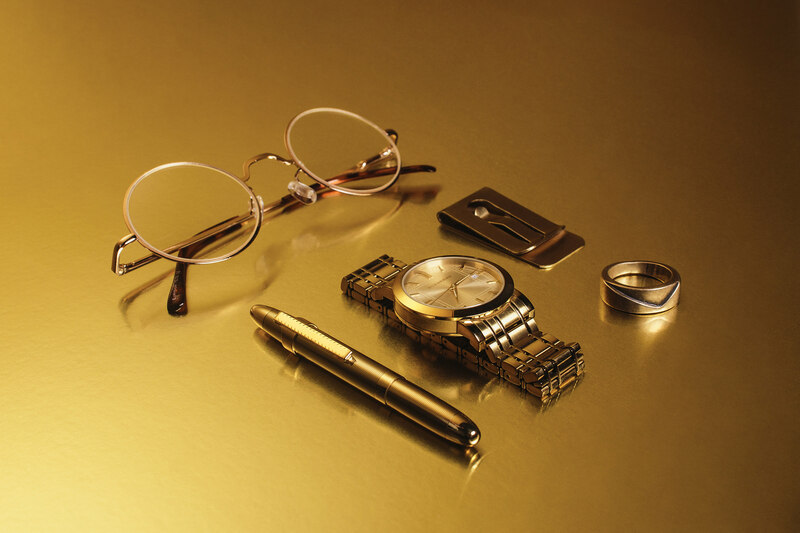 Start with a gold watch, reading glasses, a ring, a pen, and a money clip. You’ll have everyone wondering why they aren’t going where you are. 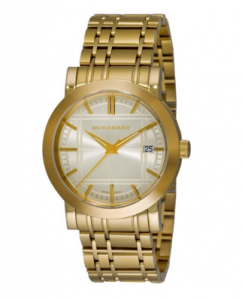 This brushed watch from Burberry features an understated, handsome bracelet. This is a great watch to have in your collection to fill the need for gold. A gold watch says a lot about a man and takes some boldness to pull off. Developed for NASA in 1965, the Fisher Space Pen uses a pressured ink cartridge that allows for writing in a weightless environment and in extreme temperatures. Featured here in a raw brass, this US made pen will patina over time, making it more interesting with every trip. When traveling, all one really needs is a card and cash. 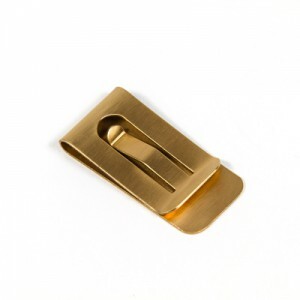 Enter the money clip, an item that’s been proven effective by bankers and gangsters alike. It’s a great way to be both functional and make a statement. This clip from Canoe is a time-tested cash holder that you’ll hand to your son someday (along with a few stories from the road). Whether you’re reading the latest GQ or the Times, some of us require a little help. These round reading glasses from Eyekeeper are perfect for travel; small, inexpensive, and very smart. Featured here in gold, these frames are extremely light with an anti-scratch lens for those times you throw them in a pocket with your keys and change. Most men only wear one ring (and that’s if you’re married), but an additional ring is an easy accent any guy can pull off. The Class Ring, designed as a collaboration between Classfare and metalsmith Caitlin Cimino, is an example of men’s jewelry done right. Unique, masculine, and unexpected. Limited to 10 pieces.